We must keep in mind that we were made to be in the image and likeness of God, therefore we are to take on His character and live by His standards, and not ours or the worlds. Remember every true Biblical Doctrine is in harmony with the nature and character of God. See what you can learn of God’s hearts desire for you. Evaluate your Spiritual growth and worship to see where you are and how you can grow more. Spiritual Growth and Worship. Our need and result of cooperation with the sanctifying work of the Holy Spirit. Spiritual growth results in SERVICE. Spiritual Growth Is an Element of Worship. Spiritual growth requires SUBMISSION (obedience - Lordship). The gift of Love: is given to everyone born of the Spirit. It is that love that motivates us to submit to God. It is that love that motivates us to separate from the world to the Lord. It is that love that motivates us to serve Him. It is that love that motivates us to suffer for Him. It is God's unconditional and sacrificial love for us that gives us our peace and joy and hope in Him. It is all the work of His gift of love in us, for Him and others, Amen. Praise God we have such a God, Amen. 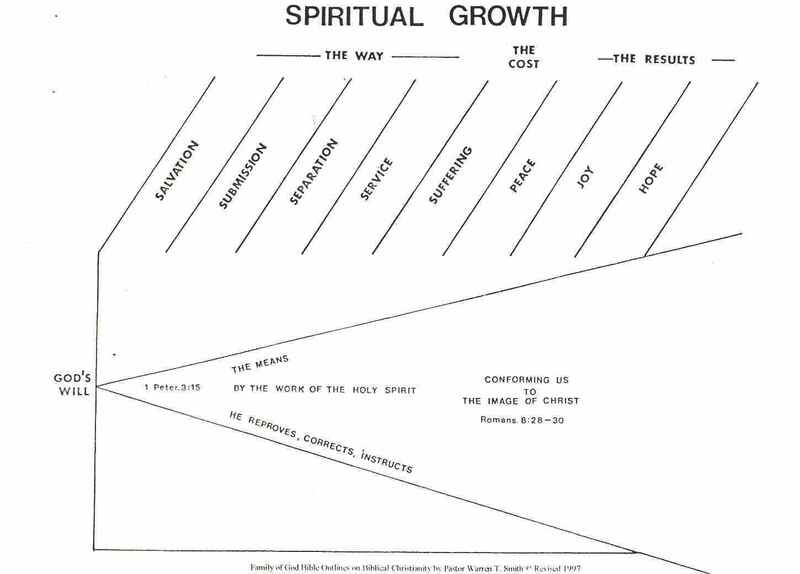 Spiritual growth is all the work of the Holy Spirit. He does this through the Word of God. All the Holy Spirit's work in us, is so He can work through us, to others. The Holy Spirit is limited in His work through us by our free will to accept or reject His leading. He must work on us before He can work through us to others. Hebrews 12:5-14 "And ye have forgotten the exhortation which speaketh unto you as unto children, My son, despise not thou the chastening of the Lord, nor faint when thou art rebuked of him: 6For whom the Lord loveth he chasteneth, and scourgeth every son whom he receiveth. 7If ye endure chastening, God dealeth with you as with sons; for what son is he whom the father chasteneth not? 8But if ye be without chastisement, whereof all are partakers, then are ye bastards, and not sons. 9Furthermore we have had fathers of our flesh which corrected us, and we gave them reverence: shall we not much rather be in subjection unto the Father of spirits, and live? 10For they verily for a few days chastened us after their own pleasure; but he for our profit, that we might be partakers of his holiness. 11Now no chastening for the present seemeth to be joyous, but grievous: nevertheless afterward it yieldeth the peaceable fruit of righteousness unto them which are exercised thereby. 12Wherefore lift up the hands which hang down, and the feeble knees; 13And make straight paths for your feet, lest that which is lame be turned out of the way; but let it rather be healed. 14Follow peace with all men, and holiness, without which no man shall see the Lord:"
Spiritual Growth Is an Element of Worship, but what is worship? An act of paying honor to a deity: Religious reverence and homage. To honor by prostrating yourself or bow down or to, kneeling to or follow after as God. Anything that becomes the focal point of your life, consumes your thoughts, and desires. That in which you place unconditional trust and dependency. What do people worship? Idols, statues, pictures, places where something special took place. Sometimes other people, family, sports hero's, actors, singers, political or military hero's. Sometimes money or material possessions such as land, homes, cars, boats, etc. Sometimes a place of authority where they can lord over others, or a business of their own. Any of the above, becomes the object of your worship and your god when your life revolves around them. Many things considered worship are only a part of worship. Such as going to church services, singing hymns, participating in ordinances like baptism, or having the Lord's Table. [communion] While all have their place as religious acts, they are not true worship in themselves, they must be the result of something far more important. True worship grows in direct proportion to your love for the Lord, and spiritual growth. The more you know your Lord the more you love Him, and want to know about Him. The more you love Him, the more time you spend in His Word. [That’s when God talks to you] The more you love Him, the more you are willing to be submissive to His will for your life. The more you love Him, the more you praise Him for all He is, and has done for you. The more you love Him, the more of your life you want Him to have. The more you love Him, the more you want to tell others of Him. The more you love Him, the more you pray. [That’s when you talk to God]. The more you love Him, the more you want to serve Him. All of these are true worship, apart from these, religious acts alone are not worship at all. Self test: on Spiritual Growth and worship. Q1. What limits the spiritual growth of the believer? Q2. In what way does submission relate to your spiritual growth? Q3. In what way does separation relate to your spiritual growth? Q4. In what way does service relate to your spiritual growth? Q5. What is meant by "suffering for Jesus"? Q6. Why is suffering necessary for your spiritual growth? Q8. If spiritual growth is the evidence of having the Holy Spirit as God's child, (Rom. 8:14) what does the lack of spiritual growth indicate? Answer this question in the light of John 14:24, 15:1-6. Q9. In what is my hope established? Q10. In what way is love related to spiritual growth? Q11. What is the goal of the Holy Spirit, and what does it require of the believer? Q12. What assurance do you have of being in the perfect will of God from this study? Q14. How do others know what you worship? Q15. What has the most effect on worship? Q16. What have you discovered about your worship? Q17. What is the relationship between Spiritual Growth and Worship? Q18. How important is worship? Q19. In what way will this study effect your worship?